The brand new Homewood Suites by Hilton Agoura Hills hotel is located off the 101 Ventura Freeway and easily accessible from California Burbank Airport and major California points of interest including Westlake Village Thousand Oaks Malibu Beaches Santa Monica Mountains and Beaches Camarillo outlet mall Hollywood sightseeing local wineries studio tours and a variety of museums such as the Ronald Reagan Library and Museum. This all-suite hotel is decorated with the look and feel of the Arts and Crafts movement and it has been designed to resemble the casual bungalow style that surrounds California*s Agoura Hills area. Upon entering the building you will be greeted with limestone type flooring beautiful woodwork Mission style furnishing and Arts and Crafts inspired carpeting. The colors throughout the Homewood Suites by Hilton Agoura Hills California hotel are a subtle play off of black with accents of burnt orange gold and green. Iron glass and decorative accessories abound thus making this truly a warm and inviting space. 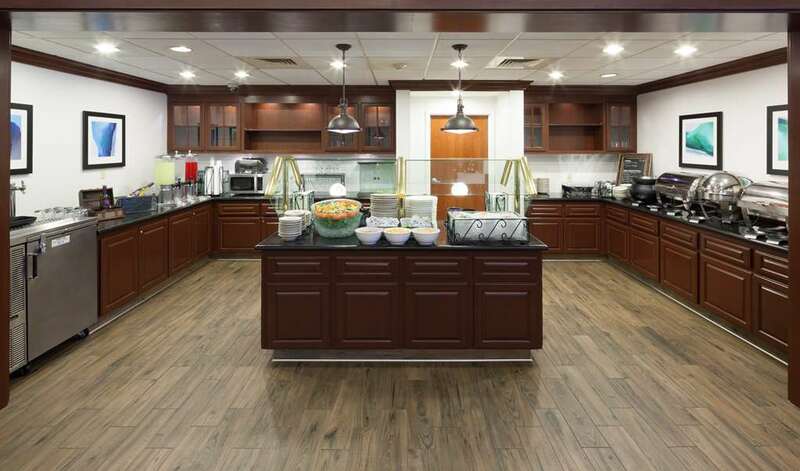 126 suites at the Homewood Suites by Hilton Agoura Hills California hotel offer complimentary high-speed Internet access well lit workspaces and two telephones with voice mail and data ports. Alternatively you may also take advantage of the complimentary Business Center for printing copying and our friendly guest service agents would be happy to assist you with faxing. Each hotel suite at the Homewood Suites by Hilton Agoura Hills California hotel contains a fully equipped kitchen with granite countertops to include a full size refrigerator microwave oven coffee maker and dishwasher. We also offer a complimentary grocery shopping service. Enjoy our Suite Start Breakfast seven days a week a Welcome Home reception Monday through Thursday evenings. Make yourself at home at the Homewood Suites by Hilton Agoura Hills hotel in California.